Denon AH-MM400 headphones review: Wonderful or just wooden? For a comfortable fit with a wide soundscape, great separation and sound quality that serves pretty much every genre of music the MM400s sell themselves. But their limited bass balance and overall design package don't add-up to make the very best £250 over-ears we've ever seen - or heard. Tired of plasticky headphones? Well, here's your chance to buy into some with a wooden exterior - Denon's new AH-MM400 reference over-ears. Which, some might think, look somewhat mad. Apt, then, that they top the "Music Maniac" range, we suppose. Sometimes it's good to be different - and the MM400 sure are quirky looking headphones. Although they're not as intense looking as their use of wood might suggest: black and silver are the order of the day really, with aluminium alloy complementing the brown walnut and looking altogether premium. If anything it's the large capped-out Denon logo emblazoned across the centre of each earcup exterior that's a little brash. We'd prefer more subtle branding. But these cans certainly turn heads, as many people have commented on them when we've been out and about. To wear the AH-MM400 are immediately comfortable. Squidgy leather-coated padded earcups sit softly over-ear and Denon has done a really good job of keeping things lightweight (310g all-in) so there's no excessive pinch during wear. Plus there's none of that flimsiness where you think they might come flying off during wear. A detachable 3.5mm cable is included in the box - although our review sample lacked this for a number of months. It's not a case of simply swapping out for an off-the-shelf replacement either (we've got a bunch of those): Denon uses a shaped surround to lock the cable into place, so you'll need that specific cable to ensure a fitted connection. Don't lose it! Otherwise, there's little else to concern yourself with in terms of features. No noise-cancelling, no onboard battery or the need to charge; these are Denon's reference cans and entirely fuss-free. The look will certainly split the crowd, as might the sound quality. The MM400's 40mm drivers are able to reproduce deep bass from 10Hz right through to beyond-natural-hearing 40,000Hz, so there's little question of their ability. But there's not a push to the low-end; so while bass is present it can lack in some tracks and leave the mids to sound a little too dominating. Radio broadcasts, therefore, sound rather "tunnelled" with presenters' voices coming across as thin. These are reference headphones though, so they're meant to sound more natural and avoid that excessive bass sound. What really impresses is the perception of surround, given the way the earcups sit lightly and fully around the ear - it gives a really floaty stereo listen with great separation. Source material is, of course, important and with the right tracks there's more impact - the bass hits in Massive Attack & Roots Manuva's Dead Editors, for example. Denon promotes its Denon Audio app, which includes a five-band equaliser and bass-boost slider to help things along in its Android guise. There's a more complex equaliser in the iOS app, but that's a pay-for £1.50 extra for some reason. 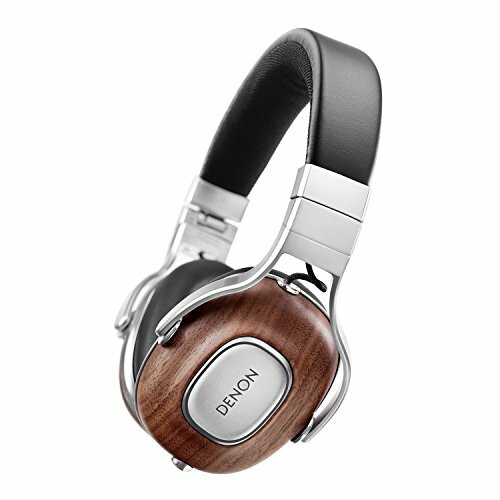 If you're looking for headphones different to the norm then the Denon AH-MM400 certainly succeed in standing out - not that the quirky American walnut wood finish will be everyone's cup of tea. For a comfortable fit with a wide soundscape, great separation and sound quality that serves pretty much every genre of music, the MM400s can certainly sell themselves. But their limited bass balance and overall design package don't add-up to make them the very best £250 over-ears we've ever seen - or heard.